Some people like to send Twitter status updates every 2 minutes about everything from what they just ate, wrote, read or pooped. (ick! Sorry, couldn’t resist). Well, what if you want to tweet something like a press release or some groovyNews but you want to schedule it rather than send it immediately? LaterBro has ya covered! 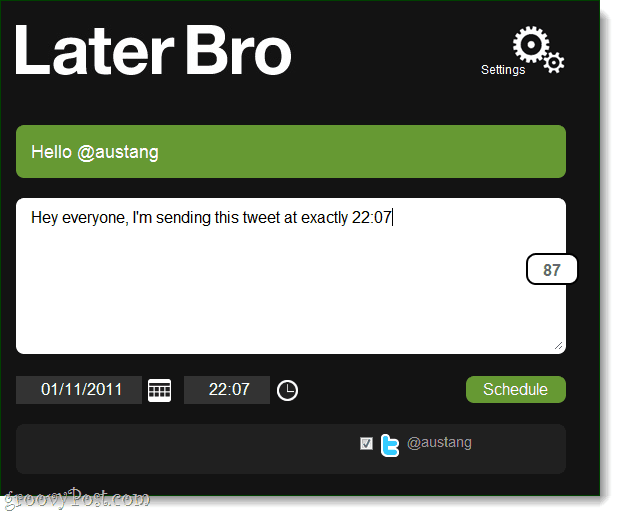 LaterBro is an online webapp that allows you to plan your tweets ahead of time. You can pre-write a tweet, and then schedule it to be sent out whenever you like. LaterBro isn’t the only web service to offer this feature, but it is dead simple and that’s why I like it. 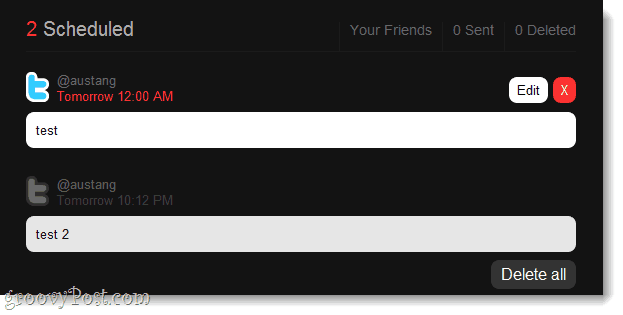 Note: This app will also work for scheduling Facebook status updates! LaterBro uses the API (application programming interface) provided by Twitter and Facebook so that it will simply connect to your account on either service. 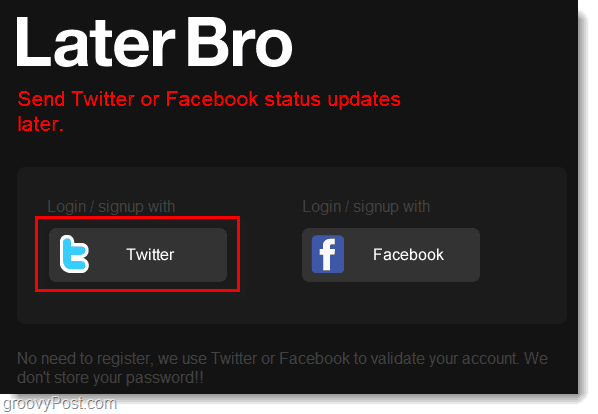 You won’t need to sign up for a LaterBro account, and you won’t need to give them any of your account credentials. Just click the service for which you’d like to schedule a status update. 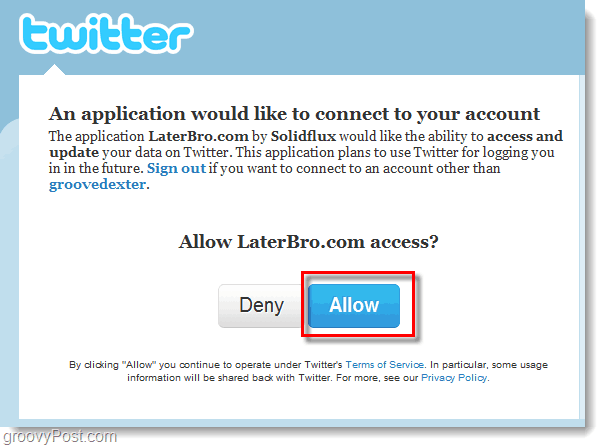 As with most web apps that connect via the API, Twitter will ask you for permission to link LaterBro to your Twitter account. Next, you’ll be brought to your Tweet Scheduling interface. Just Write your tweet, Select what time you’d like it sent, and Click Schedule. You’ll see a confirmation box appear briefly that says “Your message has been saved“. When you see this, you’ll know it’s a done deal. 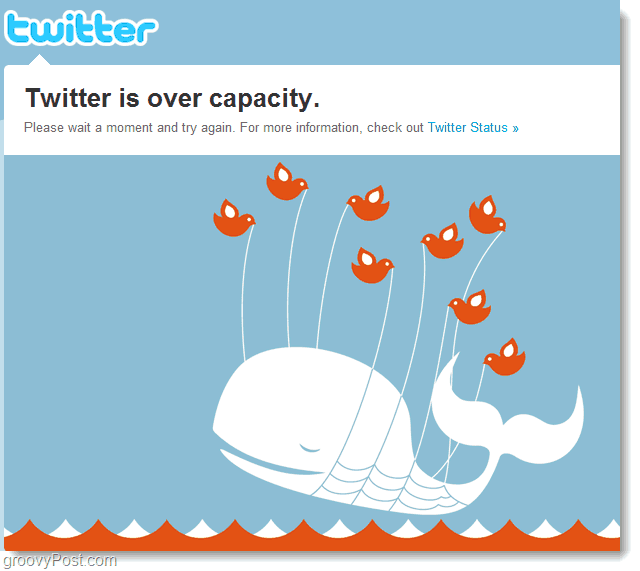 The tweet is now scheduled and will show up in your Twitter stream at the exact time you specified. It’s that simple. If you didn’t like a tweet you scheduled, don’t worry, you can delete them. Just Scroll down below the writing area and there you can reschedule, edit the contents, or simply delete all of your un-twittered tweets. Once a tweet publishes to Twitter, it will disappear from your LaterBro interface, but you can still go to your twitter.com account and delete it. 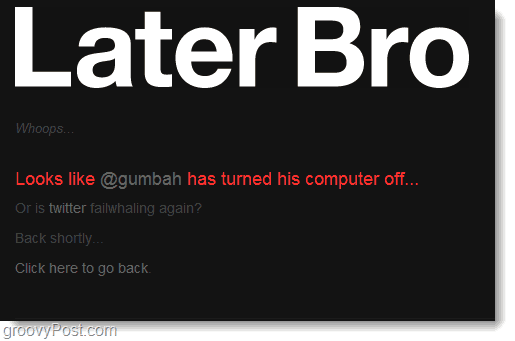 I see my share of Twitter’s fail whale a lot more than I’d like, and if LaterBro isn’t working it is likely because Twitter.com isn’t working either. Thanks for info on how the app works! but also schedule emails, status update and phone calls.